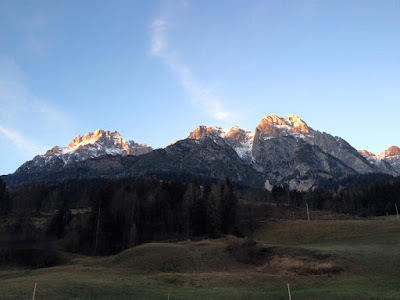 Another title for this blog could have been "slow times in Hochfilzen". 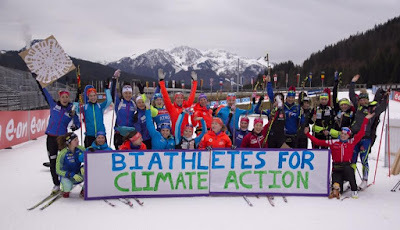 I thought I had a great race last Friday in the 7.5 Sprint in Hochfilzen, Austria. Out of the starting gate I went "full gas" around the course, only backing off briefly before the shooting stages to slow my breathing. After missing one in prone, I came into standing knowing that in order to qualify for the pursuit, I would need to shoot well. I only missed one and left the range feeling thrilled. I thought maybe I could finish in the top 40 and score World Cup points. It wasn't until well after the race that I saw the results: 83rd. I couldn't believe it! Based on my 88th rank ski time, I would have had to hit all ten targets to finish in the top 60 to make the pursuit. And just one week earlier I skied the 40th rank time! Not natural snow in the valley by the venue, but the mountaintops are covered. I think a combination of factors led to this slow skiing. 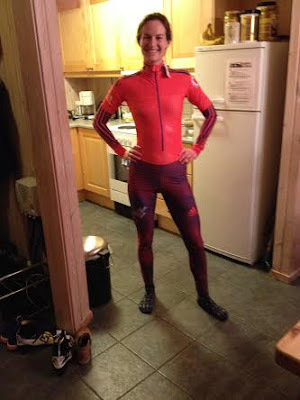 One, my body was not at 100% because I was recovering from a minor cold and a major calorie deficit after the intense week of racing in Ostersund, Sweden. 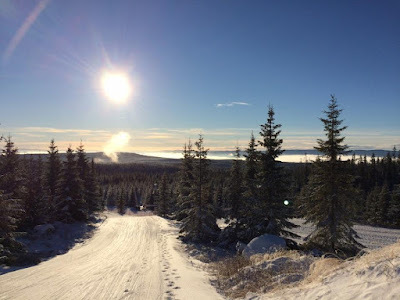 Two, the course played to all my weaknesses; it was very technical (icy with lots of transitions) and predominantly flat, so strong people with finesse on skis glided powerfully around the trail while I flailed without actually moving quickly over the ground. And three, because the course was so flat and the conditions so fast, the time gaps were tiny; feeling even slightly off or taking just one corner wrong meant I lost seconds that translated into places. For Sunday's relay, in hopes of skiing faster, I made the mistake of trying to push harder, rather than changing the way I was skiing. 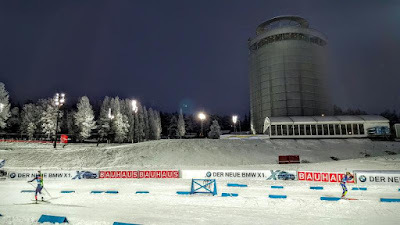 In fact I was already going full gas in the Sprint, so the only difference on relay day was that I didn't back off at all before the range, and then I missed four standing targets in a row, and ended up with two penalty laps after using all three spare rounds. This was a real bummer considering that I wasn't just messing up my own race, but the whole relay effort. Where's all the snow? This is a man-made ribbon of white. international agreement at the Paris climate conference. It is certain that I need to back off a little bit before the range. "Going harder" is not a good strategy. It is not necessarily appropriate to make changes to my race approach based on one result. What I was doing before was working well, so in the coming weekend's races in Pokljuka, Slovenia, I will go back to those basics. Trying to smile after a relay that took it all out of me, mentally and physically! "Meet the Newest Member of the US Biathlon Team"
Thanks Team USA.org for this great article! "Biathlete Clare Egan has taken a slower, somewhat unorthodox route to where she is now — almost like a cross-country skier who decided to take a detour off the conventional path, stop for a bit, and shoot at something." Read more here. Thanks to German fan Harald for this photo! After resting all day Friday because of a minor sore throat, I woke up Saturday feeling better and decided to race the Sprint. 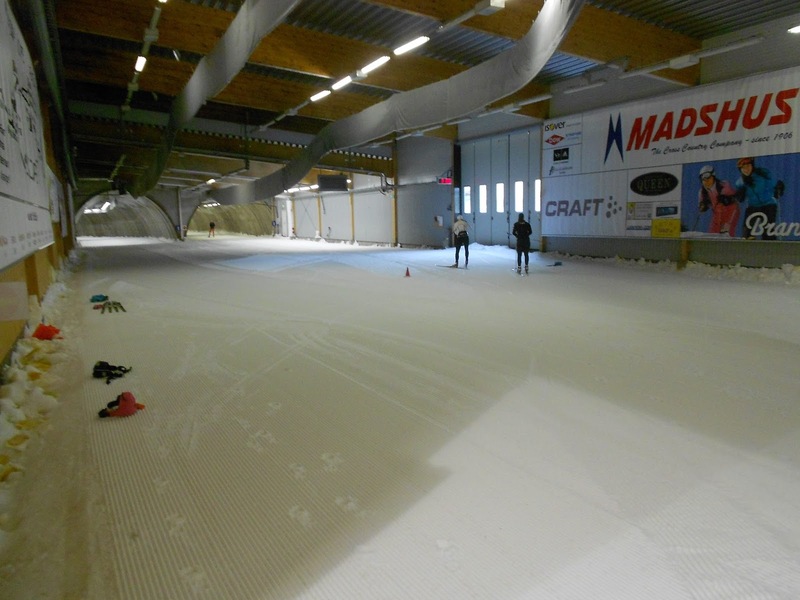 I was a late starter, wearing bib 90, and enjoyed great conditions and very fast skis on course. 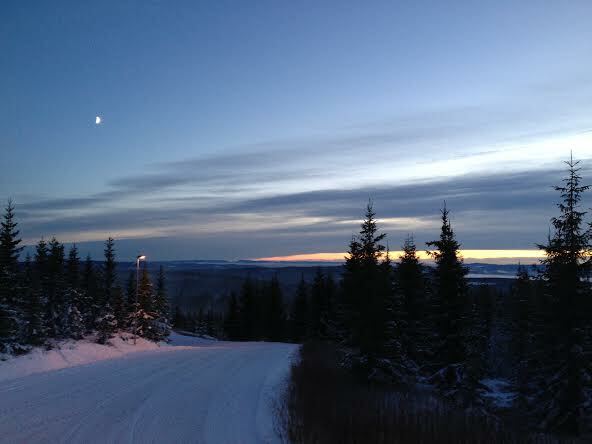 It was a clear evening with light wind- perfect for biathlon racing. I shot clean in prone and skied a faster second loop than my first loop. When I came in for standing, my goal was to be diligent about staying calm and taking my time to hit the targets. After hitting the first two, I nearly took a bad third shot as my mind wandered away from the task at hand and into the danger zone: "I wonder if I will hit all five??!!" Checking my focus, I remember thinking "you have all day to take a good shot." While this is not exactly true-- the fastest shooter in the race completed her standing stage in 22 seconds compared to my 38-- it was a crucial reminder not to rush. When you are shooting in a race, what feels like "all day" is actually only one or two very worthwhile seconds. 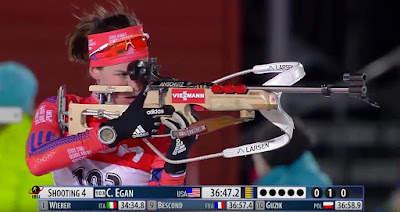 Then I hit the next three targets to complete my first clean World Cup race! I am putting a check mark on my goal list! Tucking and gasping for air on my way tot he finish line! I saw on the big screen that I was around 10th place as I left the range. 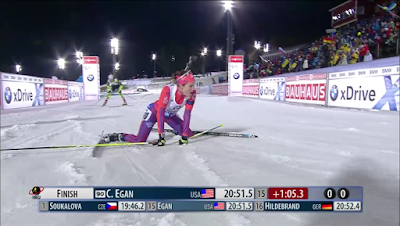 Unfortunately what followed was a brutal last lap during which even my best effort left me sliding down the results. 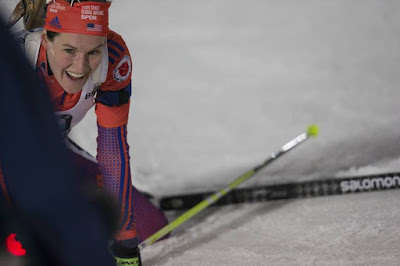 Our Team USA staff members were spread out around the course excitedly screaming at me, and the first coach I encountered yelled, "only two seconds to top 10! ", the next coach "only two seconds to top 12!" and so on, until I finished in 15th. 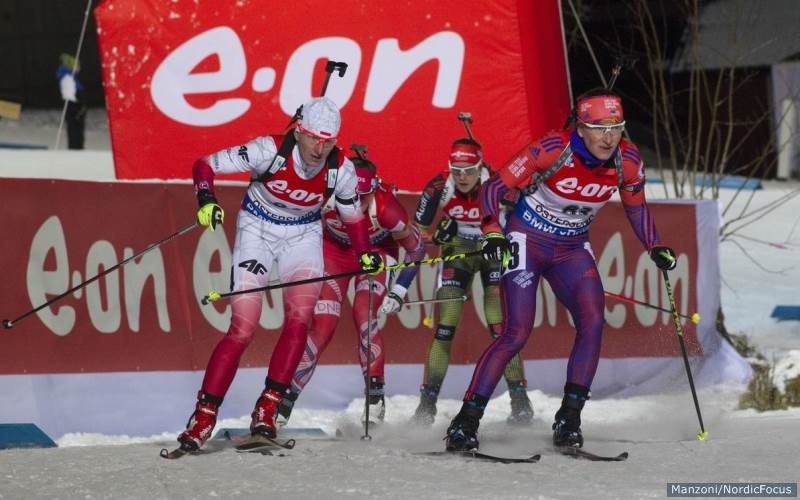 A late starter from the French team, who was the fastest skier in the race, finished a few moments after me in 8th and bumped me back to my final result of 16th. Surprised look on my face as I check the results screen! 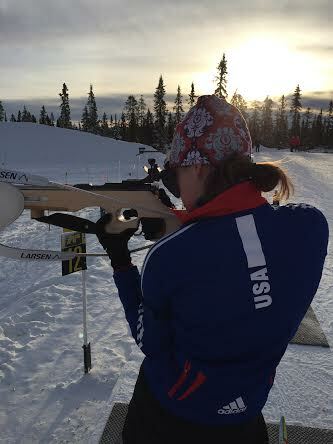 In Sunday's pursuit race, I started 16th but moved back to 46th as I missed 5 targets (1,2,1,1) and skied the 51st-ranked time. I think the first three races took a lot out of me both physically and mentally, so I did not have the same energy on course. I was also running on empty, quite literally, because I struggled to eat enough during the week due to the odd training and racing times. So my skiing was not as sharp as it can be, and I had three shots awry in prone, but I was very proud of how I overcame first-shot misses in both standing stages to hit the next four. It wasn't my best race, but I'm still satisfied with my performance. I am still getting used to the World Cup racing schedule and learned a lot last week. 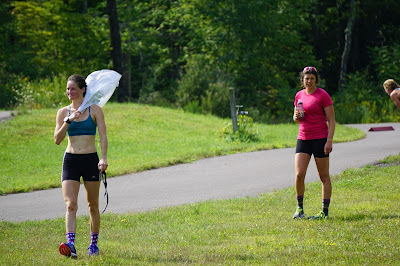 Part of the challenge at this level is figuring out how to push your body and mind through four races in one week-- and then do it again the next week. "Crawford Keeps Her Cool for 13th in Östersund 15 k; Egan Leads U.S. in 44th"
"Egan Tops U.S. Effort In 15k"
Waving to the TV in the finish area! Celebrating a new best for World Cup shooting! 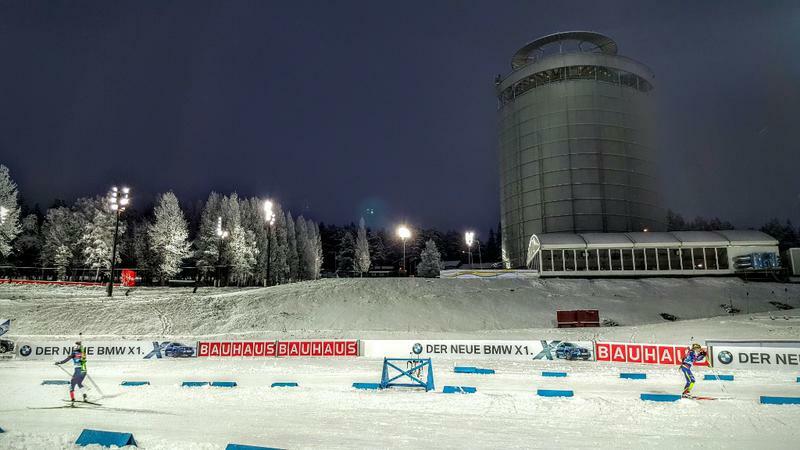 Yesterday was the first individual competition of the World Cup season. I was confident after my performance in the single-mixed relay last Sunday that I could ski and shoot my way to a good result in the 15k Individual. Great action shot of Susan in the Ostersund stadium. Susan had the 7th-fastest ski time of the day. Because it is a longer race, the 15k Individual requires more endurance fitness than top-end speed on skis, which suits me well right now since I am just starting to get into racing shape. 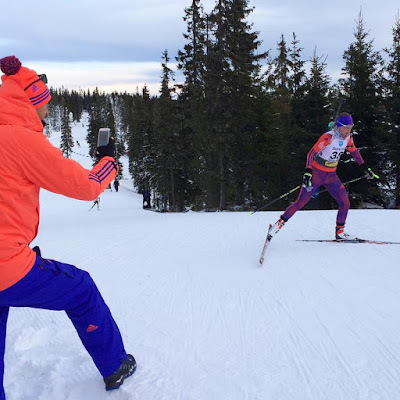 Many European teams hold their World Cup team trials one week before the opening races, so those athletes must already be in peak form in order to qualify. Our team has an earlier team selection process which allows us to focus on peaking later in the season for World Championships (and also to buy plane tickets to Europe more than one week in advance). It means that sometimes we start slow relative to other teams but get progressively faster over the course of the season. Susan, pictured above, starts fast and gets even faster! Crossing the finish line of the 15k Individual on Thursday in Ostersund. 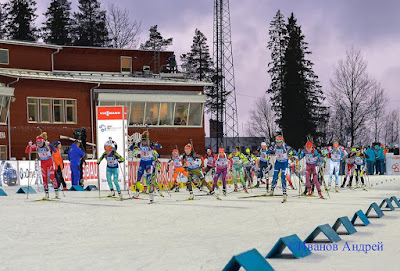 I skied a smart race yesterday and did my best shooting so far at the World Cup level. I cleaned both my prone stages, missed one in the first standing and two in the second for a total of hitting 17/20 targets or 85%. In the Individual, there is no penalty lap but rather a 1-minute time penalty added for each miss. With three misses I ended up in 44th place, +4:52 from the race winner, Dorothea Wierer of Italy. That means she skied and shot 1:52 faster than I did. Get it? Hannah leads a pack of skiers on course. It was a great way to start the season because I know I will get much faster on skis, so I am excited to do even better. Yesterday I had the 59th fastest ski time and last year when I was in great shape at World Championships I was in the top 40 for ski time. I consider this my best World Cup result so far, because although I did get 40th in one race last year, I had a lot of luck that day in the form of avoiding wind gusts on the range and starting with a late bib number after a blizzard slowed down all the early racers. Our next race is the 7.5k Sprint on Saturday. My goal is to finish in the top 60 so I qualify for Sunday's 10k Pursuit race. And a HUGE improvement from last weekend!!! Yesterday was the World Cup opener in Ostersund, Sweden. I skied the first leg of the "single mixed relay" event, in which a woman skis 1.5k, shoots prone, skis another 1.5k, shoots standing, and then tags here male partner (Sean Doherty, in my case), and then he does the same thing... and then you both go a second time!!! 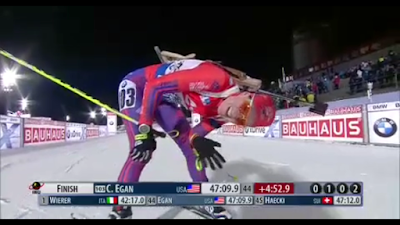 Following the last shooting stage, the man does a final 1.5k sprint to the finish. 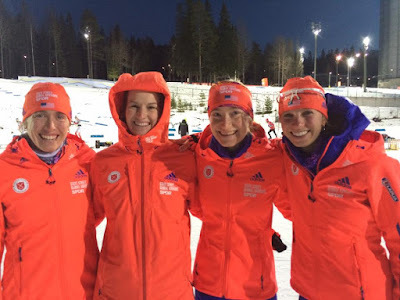 This was only the third time that the single mixed relay has been contested at the World Cup level and it is a fun race to watch and certainly to be part of! I am in the third row in the center, wearing bib 8. "new interpretation of the American flag." 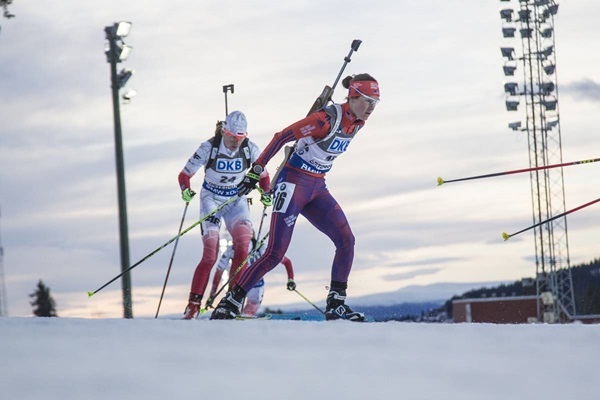 Shooting speed and accuracy are even more important in the single mixed relay than in other biathlon events, because the total ski distance/time is so short. As in all biathlon relays, if you miss any targets with your five bullets from the magazine, you can hand-load up to three spare rounds. You have to keep shooting until you either hit all five targets or have used all eight bullets- five from the clip plus three spares. If you still have misses after taking eight shots, you have to do one penalty lap per miss. So the last thing you want to do is spend 10+ seconds shooting each spare round and then still have to ski penalty laps! Ideally you hit five targets with five bullets (in under 30 seconds). I am not a fast shooter; in fact I had the slowest shooting time of anyone in the race. But I did shoot pretty well yesterday, missing only one target on the first, second, and fourth shooting stages and two on the third stage. I had to use two spare rounds each time to hit the remaining target(s). My teammate Sean had one perfect "clean" stage where he used no spare rounds, two stages where he used one or two spares, and one stage where he used all three and had one penalty loop. 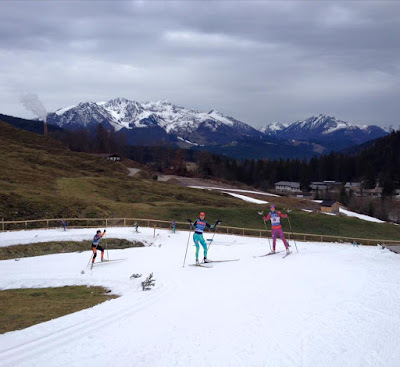 We both skied well and ended up in 15th place among 26 teams. 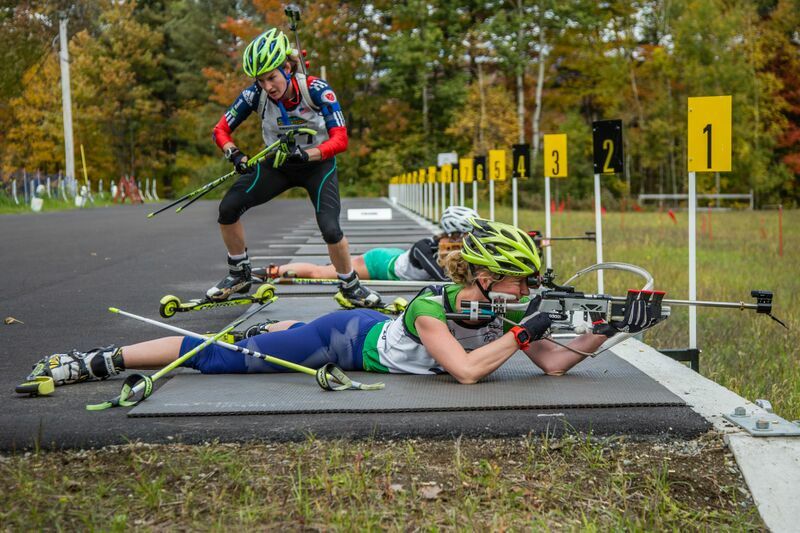 The start was chaotic but a fun opportunity to compete head-to-head with some of the top World Cup biathletes. Our next race is a 15km Individual, men on Wednesday and women on Thursday. Check the Eurovision live stream countdown to figure out when to watch in your time zone! World Cup 1 starts tomorrow in Sweden. Watch us live! 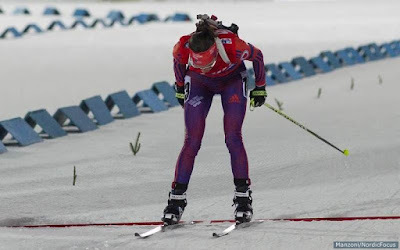 Today I got my worst result in a biathlon race, ever! I am leaving myself plenty of room, i.e. all the room, to do better next weekend. Good things that happened: my back did not hurt while carrying the rifle, I hit three prone targets, all of my standing shots were in a very tight group (all hitting an area about the size of a half-dollar) right outside the top edge of the target, and... I think that's it actually. Oh yeah- at least I am not injured. My teammate Hannah dislocated her knee cap yesterday and is able to walk but not ski. So that puts things in perspective. Last Sunday we traveled from the US to Sjusjoen, Norway, where we are training in preparation for the first World Cup, which kicks off next weekend in Ostersund, Sweden. It is truly winter here! 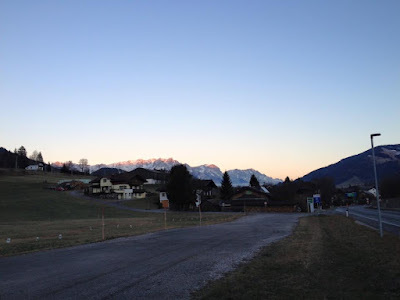 We spent the first few days here getting used to skiing on real skis on real snow, and shooting in the cold weather. 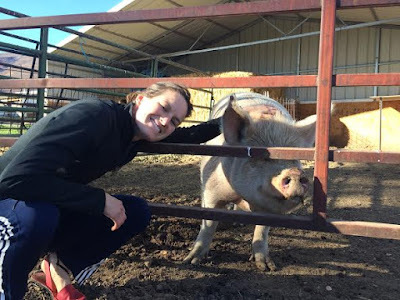 Orange and purple, "a new interpretation of the American flag"
Visiting with the Pig to whom we fed our table scraps while in Utah. I did not get the memo about the team weightlifting uniform! 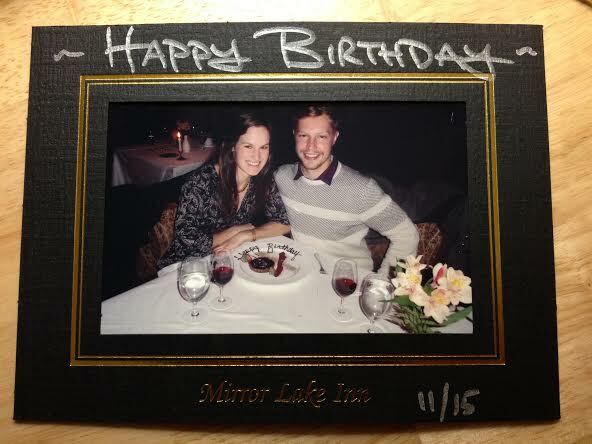 Erik took me out to dinner for my last night at home and an early birthday! 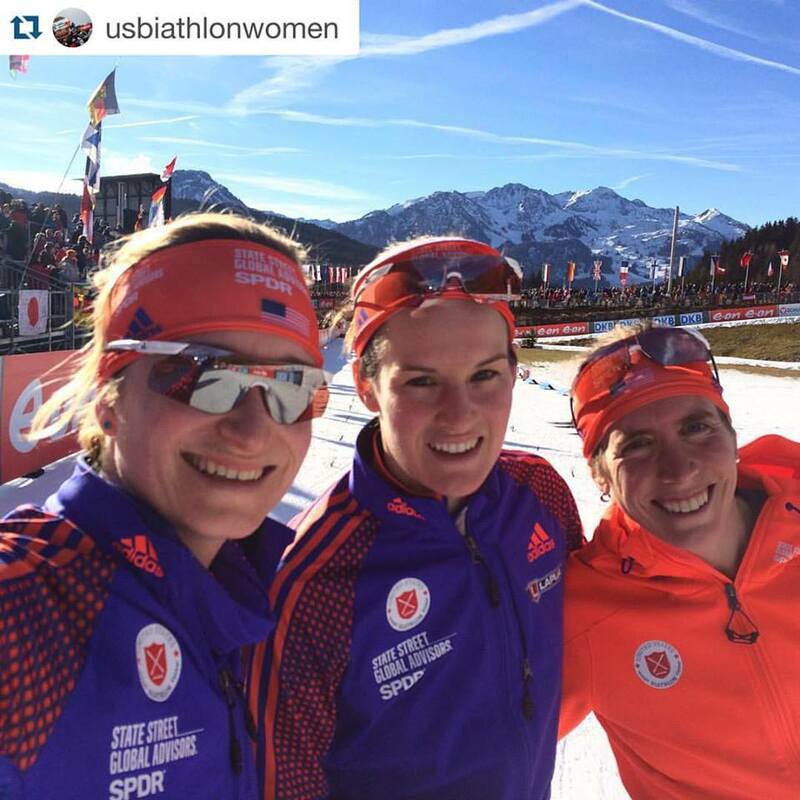 On November 3rd, US Biathlon officially announced that I will be the fourth member of the women's World Cup team for World Cups 1-3. I will race in Sweden, Austria and Slovenia before Christmas, and then based on my performance I will either continue at the World Cup level or race on the IBU Cup to try to re-qualify for the World Cup. I raced twice in October on the rollerski course in Jericho, Vermont as part of the trials process for World Cup qualification. There are four spots on US Biathlon's women's World Cup team, and two of them were already taken by pre-qualified athletes Susan Dunklee and Hannah Dreissigacker, based on their results from last year. So I and several other women at the races were vying for the other two spots. 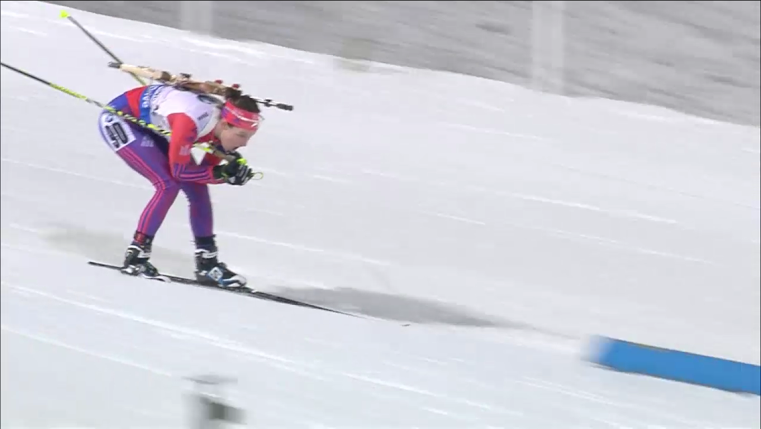 Annelies Cook was the favorite coming into the weekend and she earned her World Cup team spot decisively by winning both races. 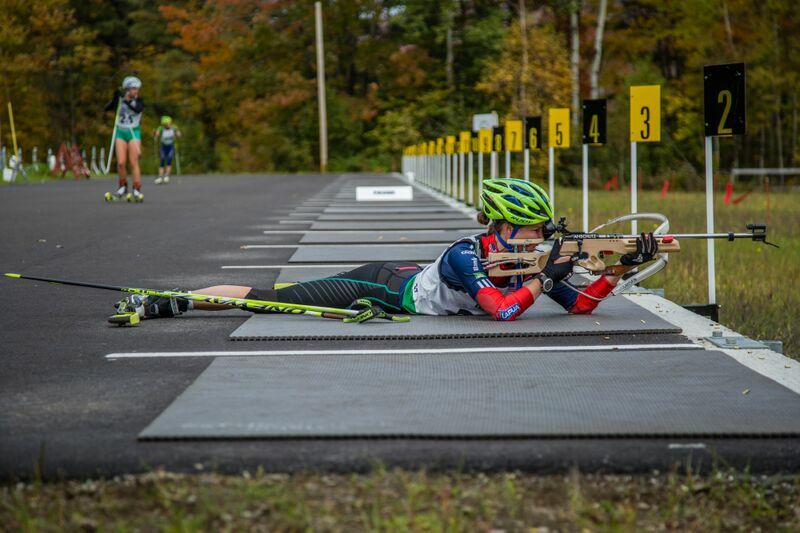 I met my goal of shooting 80% in Saturday's sprint race, finishing 2nd behind Annelies. She skied quite a bit faster than me, finishing 12 seconds ahead of me even though she skied one more penalty lap. 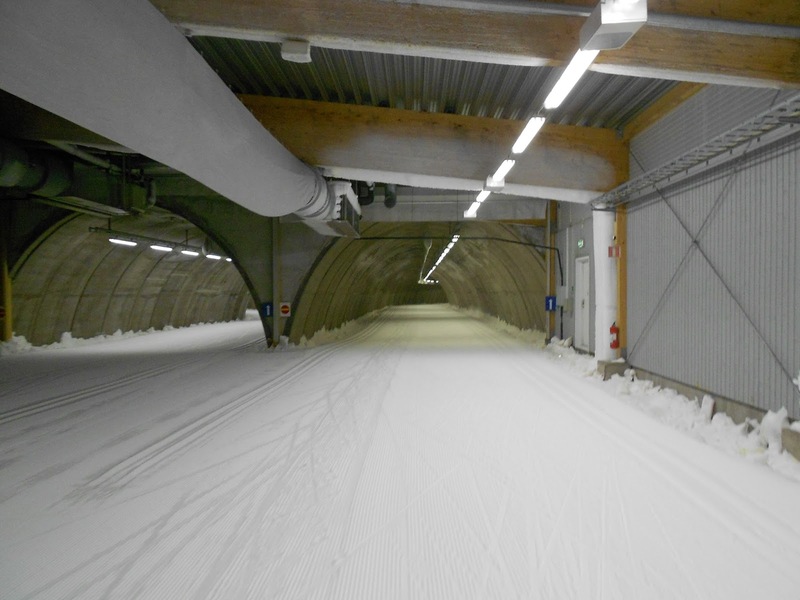 But that is about where I expected to be in terms of my ski speed, coming off a hard block of training and a long summer. 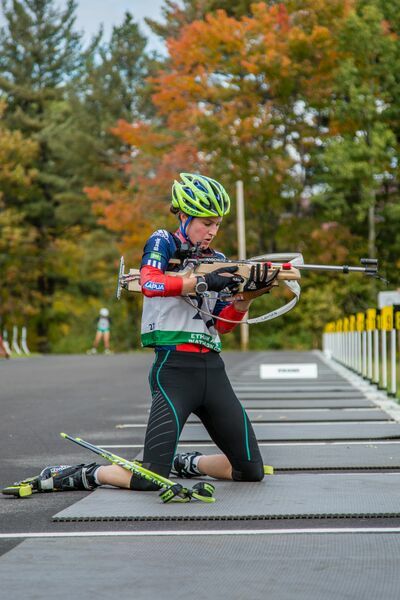 Maddie Phaneuf, our star young biathlete, was about 25 seconds behind me in 3rd place, also with 80% shooting. Going into Sunday's final trials competition, Maddie and I were close in the rankings. 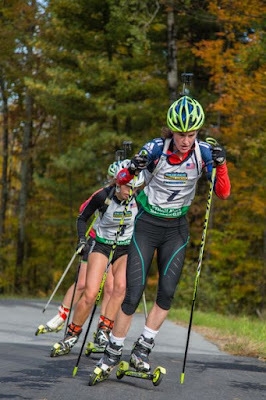 We both managed solid races to stay on the podium with Annelies, but we traded places from Saturday with Maddie edging me by 5 seconds to take 2nd place, with three misses compared to my four. 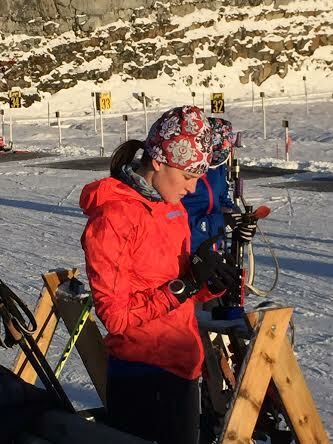 When we added up the times from the two August trials races and two October trials races, my cumulative time was good enough for 2nd place behind Annelies, so I earned myself a trip to Utah for training and a shot at the World Cup. For results and and press from the trials event, check out this Fasterskier article. It all starts in the spring, when the racing season ends and we can let our bodies rest and recover for most of April. We start working again May 1st, slowly getting back into the rhythm of training: rollerskiing, running, biking, hiking, strength, and a lot of time lying on a shooting mat trying to fix or improve whatever wasn't quite right last winter. Beginning of the training season... lots of energy, as seen here on the summit of the Cascade Mountain, featuring the US Biathlon women's A Team (L-R) Super Suz, me, Andrea Henkel Burke (former German national team member and Olympic champion, married to American Tim Burke), Hannah and Annelies. In June, it gets real. The hours go up and so does the level of intensity. 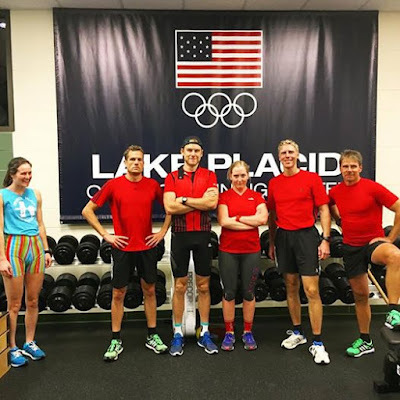 Our yearly schedule is made up thirteen 4-week blocks, and during the training season, each week of each block has a particular focus such as volume, intensity or recovery. 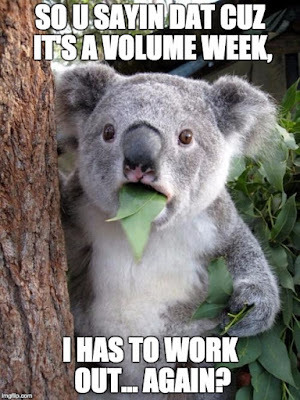 During an intensity week, we may do four or more high intensity sessions, but the overall hours are relatively low, whereas a volume week consists of twenty or more hours of training, most of which are low intensity. All of this is to say that in June we start to get tired! July seems easier, because you are used to it by now and the sun comes out. Above the clouds on top of Algonquin. The very top of Whiteface is the only other thing poking its out of the clouds, way in the background on the left. 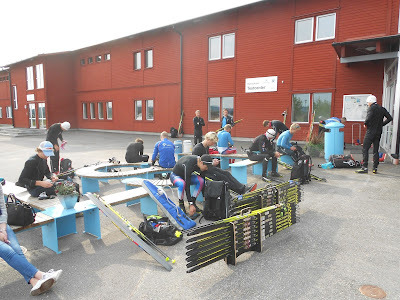 This year, I went to Ostersund, Sweden with my team for three weeks starting in the end of July. During the first two, it was predominantly rainy and in the 40's and 50's. (...IN THE FORTIES.) Then in the third week, the sun came out all day and all night too. We headed to Torsby, Sweden, where for a few hours each day we went underground into a refrigerated ski tunnel, complete with a biathlon range. Getting dressed and ready to head into the tunnel. The stadium area of the tunnel. It is about 22 degrees inside, year round! You can choose from two scenic options, clockwise or counter clockwise! I bought a new rifle stock while in Europe and got to test it out there with Gerold Sattlecker from the University of Salzburg, who uses force plates and other equipment to track the movement of the rifle and the forces acting upon it. When we flew back in the US in the beginning of August, we thought we'd timed our arrival well to miss the summer heat wave, but no! 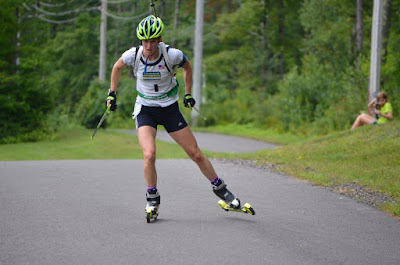 It hit just in time for our August rollerski races back in Vermont. On my way to the finish line! Just look at how read my face is. Unfortunately neither of my races went well. I really struggled to shoot well with the new stock and lost way too much time zooming around the penalty loop. 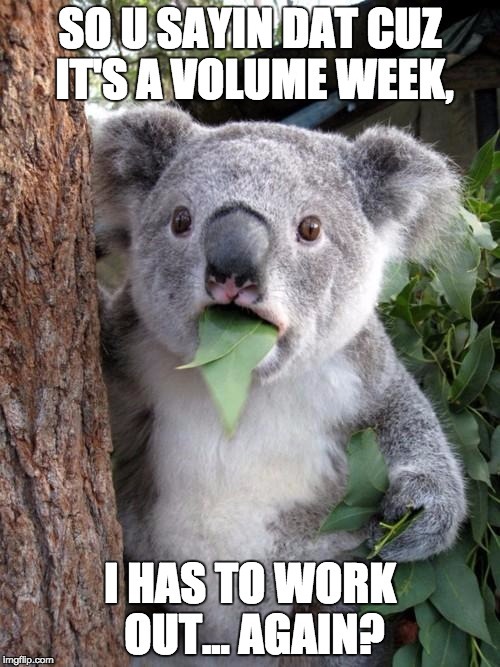 Back to work! We returned Lake Placid and started another training block. 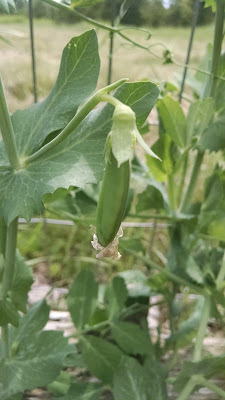 The heat continued to be a challenge for us, but at least the peas in my garden flourished. 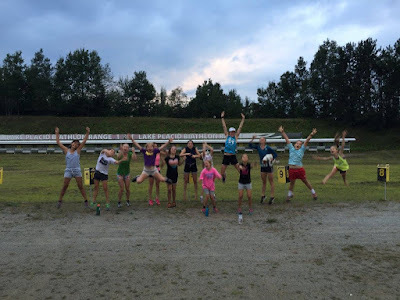 Annelies led a girls' adventure group this summer, which was a huge hit. I helped out on "biathlon day" and had a great time. My boyfriend and I have a plot in the Lake Placid community garden. It was our first foray in gardening and these are our prized peas. 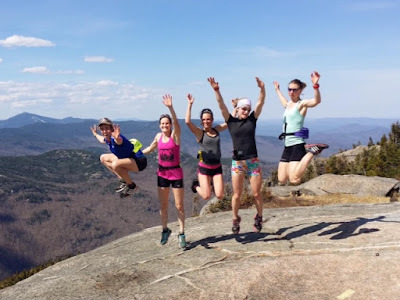 Annelies' girls' adirondack adventure group. I'm in the turquoise shirt in the middle. Then I got really, really tired and needed a break so I went on vacation to the Jersey Shore with my best friends. This is very typical for the end of August. Kayaking excursion in Cape May! 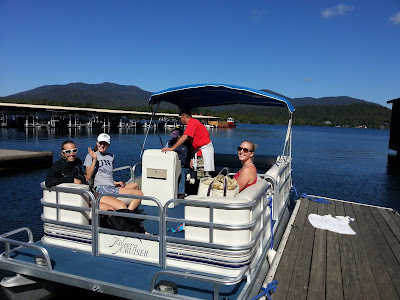 Motor-boatin' with Captain Tom on Lake Placid! Bathing beauties Susan, Maddie, me and mom along for the ride. 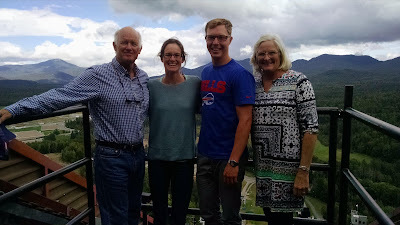 View from the top of the ski jump with my parents and Erik. And just like that, the training season will soon come to a welcome end. 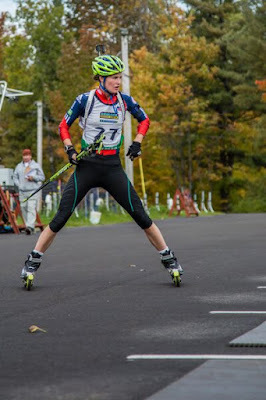 We have our second set of roller-ski trials on October 10th and 11th in Jericho, VT. From there, I am planning to join the rest of the A-team for a training camp in Utah, pending my qualification at the rollerski trials. October will roll into November and we will say farewell to beautiful brisk Fall days and hello to dreadful, rainy dark and cold ones. But by then it will be almost December and snow will be on the way! You see how it goes... flying by!